We completed the well below in February, 2013. Madison Quakers, Inc. received a request from the village People’s Committee in 2011 to fund the drilling of a well for a hamlet in Nghia Tho village. Paperwork for the well drilling was begun March 2012 and finished in June, 2012, when drilling finally began. The villagers of Nghia Tho are all H’re, one of Vietnams 53 ethnic minorities. The population as of May, 2012, is 1177 people from 335 families. 232 of the 335 families, or more than 69% of the village population, live in extreme poverty. Read more about how Phan Van Do's persistence in the drilling of this well was the reason for its success in beating the odds. 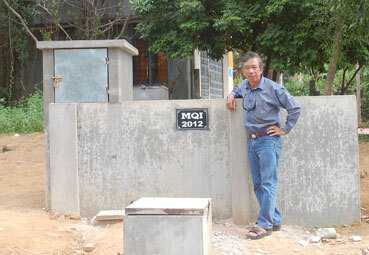 Eighty percent of all wells drilled in the province by the Vietnamese government have failed. In 2005 the Australian government funded the digging of a number of wells in this and other nearby villages. However, they dug only to bedrock so the villagers are without water from May through August. They must then climb into the mountains, find streams that have running water, fill small buckets with water and climb back down to their homes. Not only is this extremely hard but it took much time from their daily lives. After drilling through almost 300 feet of granite the well driller finally struck a good flow of water. Drilling the well was only one part of the process, however. It was Phan Van Do’s oversight of every aspect of this project; from hand delivering all paperwork to the proper authorities for processing, to designing the holding tank, piping, pipe connections, teaching the villagers how to use the equipment etc., that was responsible for the success of the this water well. Almost 30 families have access to this well water and we are now raising funds for the construction of another well in the village for next year. 1. The ethnic H'Re expressed their wish and their need for water and asked if MQI could help them. 1. Monthly there is a person going from door to door of the beneficiaries to collect money for electricity use for the water pumps. Everyday water is pumped for 4 hours. 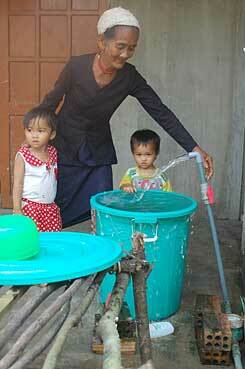 In many villages in the mountainous regions in Quang Ngai province residents don't have water during the summer months. Existing wells were dug only to bedrock. 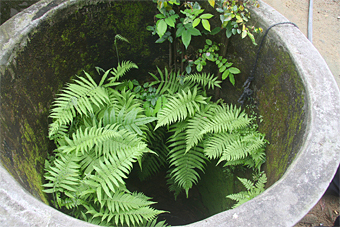 These wells provided water for eight months of the year but dry up during the hot season. Therefore, the people must walk up to streams in the mountains to carry water on poles and small buckets back to their homes for their use. MQI project coordinator Phan Van Do has been working with village elders and professional well diggers researching the engineering logistics of these projects. This research willl allow MQI to immediately dig these wells deeper once sufficient funds are raised. In addition to the drilling, donations will be used for the pumps, pipes, faucets, and the supplies for the basins. 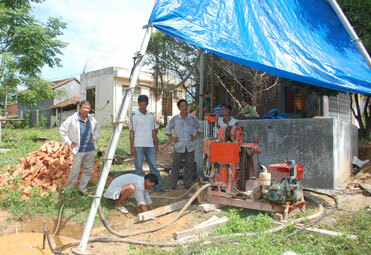 Phan Van Do overseeing the drilling of the well. Nghia Tho children play in the fresh, clean water. Phan Van Do with the holding tank. This existing well provides water to the villagers for about 8 months out of the year. Because it was dug only to bedrock, it doesn't provide a year-round water supply. Contributions are needed to fund the drilling of up to 120' of bedrock, which will provide water year-round.